I once read that your brain is more active when you’re asleep than when you’re watching TV. Do I believe it? Absolutely! Sleep can be fun, exciting, terrifying and truly exhilarating. People dream many times a night and only remember a fraction of them the next day, and then only until they take their first sips of morning coffee. By then, even the most intense dreams, both good and bad, are rapidly fading into oblivion. Considering that we spend approximately one third of our lives asleep, wouldn’t it be nice if we could actually use that time for something more than just resting our bodies? After all, in dreams, we often go places that we can only… well, dream of. This is my first-ever guest post, and considering that Laura has already spent a full month reviewing my books on this blog, I see little reason to turn my post into a blatant self-promotion of my novels… so I’ll do that later. First, I would like to introduce one of my stranger pastimes: lucid dreaming. Put simply, a lucid dream is a dream in which you are consciously aware that you are dreaming. The crucial difference between a normal dream and a lucid one is that if you are dreaming of being chased by a tiger and unaware that you are in a dream, then you will of course run for your life, but if you are aware that you are safe in bed and that the tiger can’t really eat you, then you have a multitude of options, much like being in a total virtual reality simulator. I did touch very lightly on the topic of lucid dreaming in my first novel, in which the protagonist is forced into a lucid dream. As I describe there, it is indeed “the strangest feeling, being in two places at once,” knowing that you are in your dream and knowing that you are, at the same time, in bed, asleep. Unfortunately, you can’t really appreciate what that truly feels like until you experience it firsthand. And many people do. It isn’t entirely uncommon for people to have a lucid or semi-lucid dream every few years, but with some simple training, the frequency of these can be increased to once every few days. Why read fiction, watch movies or take vacations in exotic locations? Because it’s fun! And not only that, with lucid dreaming, it’s entirely free! No purchases, no passports, no lost luggage. Admittedly, no souvenirs or photographs either, but as long as you’re just lying there in bed, why not? Unlike normal dreams, lucid dreams often remain in your memory just as clearly as waking-life experiences. Using no behavior-altering drugs, you can choose to take part in completely non-addictive, mostly enjoyable and often exhilarating hallucinations tailored to your own wildest fantasies: your brain, your game. So, how do you learn to wake up inside your own dreams? There are numerous websites dedicated to this and I am not going to offer a detailed training course here, but in short, the key is to become more aware of your own dreams so that you know it when you’re dreaming. One commonly used method is to keep a dream diary. Yes, the exact same thing some psychologists tell their patients to do. But let’s assume that you are not in need of therapy at the present time. Keep a dream diary nonetheless. When I first started, I made it a habit to quickly write down my dreams as soon as I woke. This didn’t work. I write too slowly to retain half of my dreams. They fade away before I can get them down onto paper. What eventually worked for me was to keep a voice recorder by my bed. I would grab it and speak into it in the present tense as soon as my eyes opened. Then, later in the morning, I would transcribe the contents into my word file. Here is one example of a dream diary entry: I am standing in a wide, arched tunnel lined with oval doors. There is someone standing behind me, telling me that I have to do something quickly, but I can’t understand what he wants me to do. He gets angry, and says something like, “If you don’t, I’m going to have to call the face.” I turn toward him, but now he is running away from me. I follow, drifting slowly into a dark pipe. There is a door on my left, and I enter without opening it. I am in a square room with many people, some of whom I recognize but can’t name. I think they are from my high school. They are drinking something. I ask them what, but they don’t know. Weird? Not really. Not by my standards, anyway. This one was actually pretty tame, and some of my dreams are much too embarrassing to let anyone read. Here is one that became lucid midway: I am walking in a park. There are benches to my left and right, very long and partly covered in sand or possibly snow. I see a man with a knife. He says he needs to cut down all the trees because they are poisoned. I tell him that he’ll need a bigger knife. I look down at my right hand, and notice that three or four of my fingers are too long for this to be my real hand. I realize that I’m dreaming. I jump high into the air and ask gravity to reverse itself. It works, and I continue to fall upwards, faster and faster. The man with the knife says, “Hey, you can’t do that.” I reply, “Yes I can. It’s my dream.” Slowing down, I float higher, but now I’m deep beneath the surface of a dark ocean. I swim up to the surface, surrounded by a swarm of brilliant lights that are pulsing to the rhythm of a song I once knew in my youth. You get the idea. Once a dream turns lucid, you are the leading performer of your own personal fantasy movie. Note that you won’t get total control over your dreams, but you will have comparatively more control, which is what makes lucid dreaming so enjoyable. In fact, if you gained total control, it probably wouldn’t be as fun. Yes, I read fiction. I watch movies. Sometimes I even travel for real. These are all enjoyable pastimes in their own rights. But none of these can be done whilst asleep. Lucid dreaming adds to the day (or night), since you get to go out on little psychedelic adventures as you quietly snore. I also found that becoming more aware of my dreams (and hence theoretical subconsciousness) made me a happier person in the daytime and possibly even a more creative writer. Thus, while my first novel isn’t actually about lucid dreaming itself, I couldn’t resist throwing it in as a minor plot element… a sort of fantasy within the fantasy. I suspect that many writers (particularly fantasy fiction writers) occasionally turn to their own dreams for inspiration. 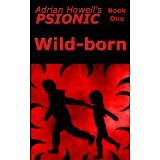 And now for the blatant self-promotion part of my post: My first novel, Wild-born, will be available for free download this weekend (March 16th and 17th, PDT). Find it here at Amazon.com or here at Amazon.uk. For more information about my writing, find my blog here, and if you haven’t seen them already, find Laura’s reviews of my books here: Wild-born, The Tower, Lesser Gods, The Quest and Guardian Angel. I decided to review books four and five together as I read them without a break. A testament to the building of plot and suspense: I simply could not wait to find out what happened next after I turned the final page of The Quest. The first three books set up and build upon the endearing characters of Adrian, Alia, and Cindy. 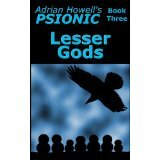 As they inhabit the world of Psionics so they accumulate other equally rounded characters (Mark and Terry as examples). By the time you reach book five, every character whether minor or major are recognisable. The cast is truly staggering but each character Howell chooses to embellish with back story and personality is integral to the finale. Book four had an unusual plot structure with most of the dramatic action happening at the beginning and then journey-style action happening in the middle. The final portion of the book slows down a beat or two but Howell still manages to keep the intrigue high. Although unusual the plot structure works immensely well. A whole host of new characters are introduced. I was concerned at first that they would overshadow the existing characters but they get roped into the overall story well and Book Five could not have worked without them. Although introduced towards the latter part of the series Howell gives enough time and attention to each character so that they do not get disregarded as another name or faceless character. Book Five was a satisfying solution to the pentalogy. All loose ends were seen to and all plot points were given ample attention. Again a few more new characters were introduced with ample amounts of detail balanced with keeping the plot moving forward. 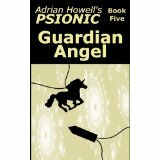 Unlike Book Four, Guardian Angel had no let up of action. A points there may have been a little less action and a little less life-in-danger at points but the pace was unforgiving. After all the building of tension between the factions, high drama was to be expected and Howell definitely did not disappoint. I do not want to say too much more about the series as I do not want to give any more away about the plot than I have already. The whole pentalogy is truly worthwhile reading. For anyone who wants to try a book by a self-published author this is definitely the place to start and the bench mark to set against the others in the market. 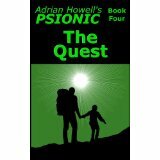 Just because it is self-published Howell has proved quality does not need to be compromised. On a personal note I’m a little sad that I’ve finished the series. Back to Lord of the Rings I guess! He narrowly escapes Ralph and manages to find a quasi-family he can just about tolerate. But the new family isn’t enough, he is still haunted by the idea that his sister is captured and alone. So he risks it all to find her. Landing himself and Alia in an underground prison. 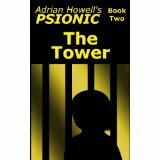 Book Two: The Tower sees the return of Adrian, slightly older and yet still facing a mass of trouble due to his recently gained powers. Fresh out of captivity, Adrian looks forward to respite in a safe environment surrounded by people like himself. Cindy and Alia live with him and they find between them a semblance of normal family life. Then he meets Terry. She abuses, humiliates and bullies him, all in the name of education. Howell does a lot of character development with the younger members of the cast. Alia no longer cowers and whimpers in the presence of strangers but she still relies on her older brother to keep her safe. Adrian is learning to listen to authority but still struggles to surrender complete control. Terry is an enigma to Adrian in the beginning and their eventual truce impacts both of their developments. It is interesting when characters develop because of their interaction with each other rather than the happenings in the plot. It gives the characters an extra dimension of humanity. Alia is able to communicate with strangers because she feels safe and protected by Adrian and also through being desensitised to it after her incarceration. This shows she is overcoming her past demons and accepting her current situation as her new family. The Tower takes place in very few locations compared to the first book but the development and dilemmas faced by the characters are increased ten fold as the Angels seek what they are truly after and doubt creeps into the mind of Adrian. What do his dreams really mean?